Ok, so remember way back in March I asked for some helping picking a couch? Well I STILL have not bought a couch. Honestly, I bought my laptop in one day, I am going to book a trip this week without blinking an eye, but a COUCH? Apparently that is impossible for me. 3. I rarely actually use my couch, so why would I invest so much in it when I can use that money to pay down my mortgage? So Hampton, I love ya, but I don't think you will make the cut. I am really, really digging the idea of a green couch now. My condo had shots of green already and the colour has just been growing on me lately. I think it is so youthful and fun! 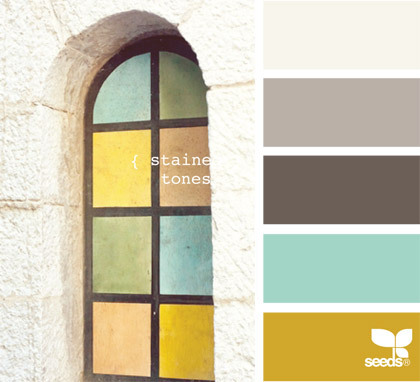 Remember my colour inspiration? There is that beautiful apple green in there. 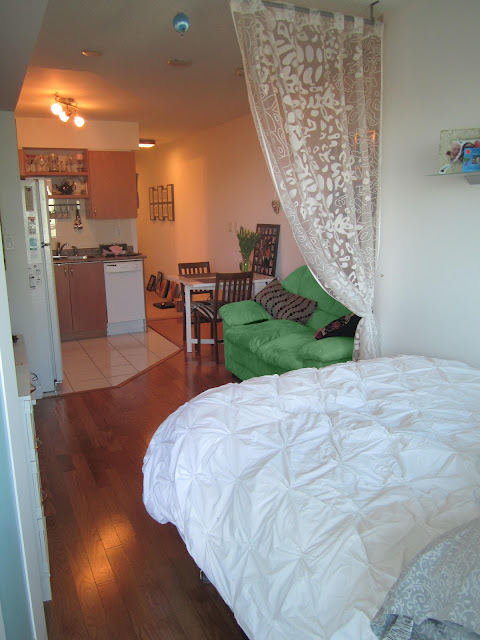 I know a white couch would be so much easier to buy and have look good, but everything in the condo is white, and I just think it might get boring. The other day, I actually started looking at Ikea. I know, I know! I said I was NOT getting an Ikea couch. My place has so much Ikea. 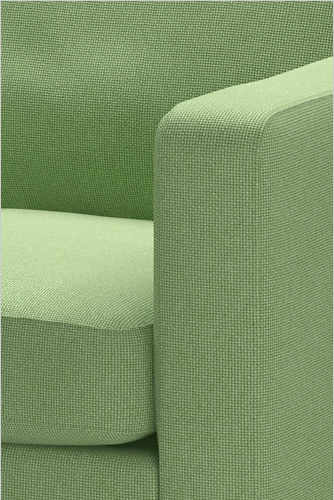 But I was on their website and I kinda fell in love with this green Karlstad couch with a chaise lounge. Do you know how hard it is find a loveseat with a chaise?? That is why this caught my eye. The only issue with a chaise is that there is a gap of a foot or two from the foot of the bed to where the chaise would be, creating a weird gap between the side of the chaise and the foot of the bed. No likely. Go hit the road, chaise! So then I started to get my heart set on the regular Karlstad couch, sans chaise. I went to Ikea over the weekend to check out this couch in person and give it the old sit test and check out the quality of the material. And you know what? I still liked the colour, but I was not digging the fabric. It was this cheap nubby-type of material that would seriously attract a cat because it looks so tempting to scratch. The couch itself, was in fact very comfortable at least. 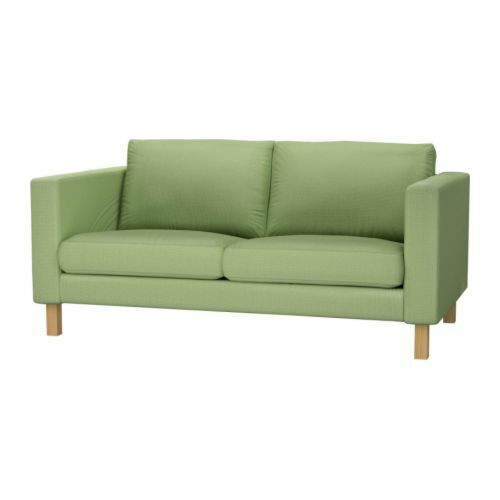 But upon wandering the couch section, I learned something- lots of Ikea couches come in this apple green, but with different types of fabric! Hey-O! I started to admire this Sandby couch next. It was a smoother material, and my friend Sarah (once I engaged her in some feverous BBMing) pointed out that it was a bit less "ikea-ish" than the Karlstad. I am not really sold on the skirt on this couch, because I have a theory that furniture should float in a small space. However I think it could be altered with a staple gun! haha. But then Sarah asked the all-important question: "Do you really think green will work in your condo?" And truth be told, I started to doubt myself. So I decided to think on it, and play with colour to see how this would look. A few weeks ago I discovered my laptop had Photoshop Elements, so I decided to do a little design work and see how my current couch might look in green. Hmmm I am still not sure. Photoshop wasn't perfect- the colour was hard to match. Please, please, please give me some input! Would green work in here? Try and picture it "less neon" haha. 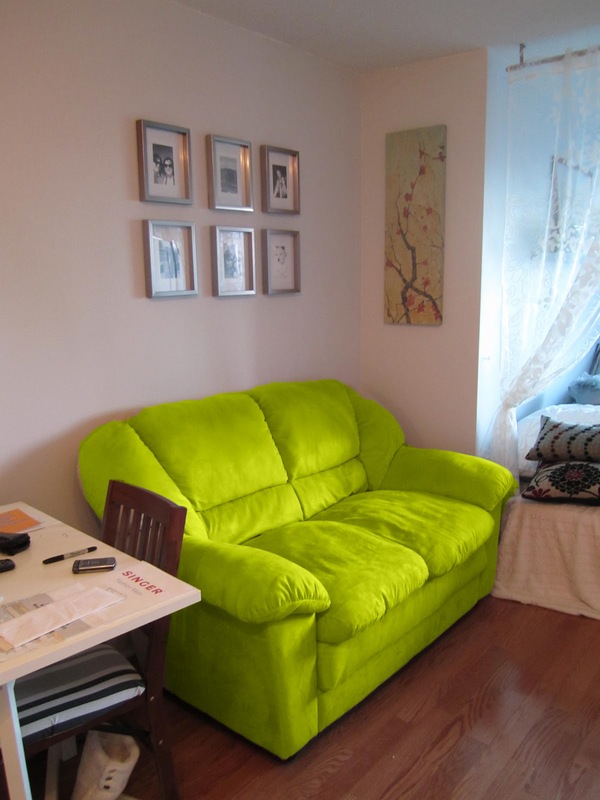 But seriously- would you do a green couch? Why am I so indecisive? Why don't you get a plain couch, with easy slip cover options so you can change it up? Ikea is probably the place for this, but you could make really nice slip covers! c) I think "vee" is right.... you totally need get slipcovers... plus I bought my last couch for ~250 from the brick onsale... it was good quality and I really loved it.. I think you should be able to get one for under 500 dollars. Hmm, I agree about the slip covers, or you could get a cream couch and have green-ish accent pillows?? World Market has a couch with a chaise -- in several colors... and not too expensive. I dont think world market is in Canada- but I do always hear such great things about them!! table. Love my living room furniture.